A. J. Johnson's beautifully hand colored 1864 map of Italy. This map shows cities, topographical features, railways, ferries and roads with color coding at the regional level. 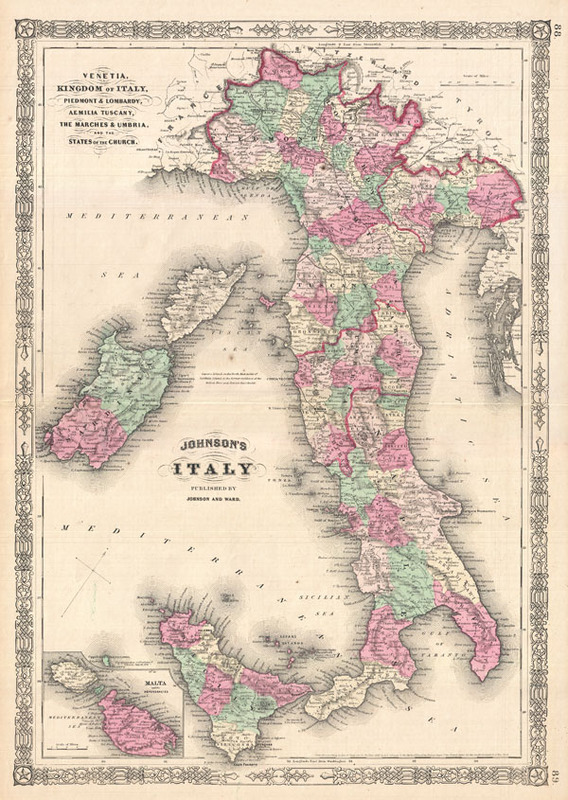 Johnson introduced this map in 1863, replacing an earlier map of Italy that divided the peninsula into northern Italy, consisting of Tuscany, Venice, and Piedmont, and southern Italy, including the Kingdom of Naples and the Two Sicilys. This bold move was no doubt a response to the Italian solidarity movement which, in the early 1860s under Garibaldi and his ‘Red Shirts,' unified the Italy under a single administrative government.